The topaz has been known for at least 2000 years and is one of the gemstones which form the foundations of the 12 gates to the Holy City of the New Jerusalem. These so-called apocalyptic stones are intended to serve in protection against enemies and as a symbol of beauty and splendor. It cannot be proved conclusively whether the name of the topaz comes from the Sanskrit or the Greek, though the Greek name 'topazos' means 'green gemstone'. 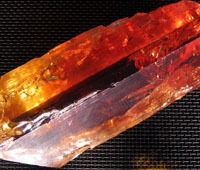 The Romans dedicated the topaz to Jupiter.The colour in which the topaz is most commonly found is yellow, and that is the colour in which it occurs in one of the major German gemstone rocks, the Schneckenstein (a topaz-bearing rock said to resemble a snail) in Saxony. In the 18th century, it was mined there during a period of over 60 years. However, most of the crystals were hardly a centimetre in diameter. One can go to Siberia or Brazil to find crystals as large as one’s fist. 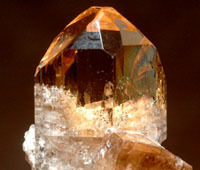 In mysticism, the topaz is attributed with a cooling, styptic and appetising effect. It is said to dispel sadness, anger and nocturnal fears, to warn its wearer of poisons and protect him or her from sudden death. It is reputed to make men handsome and intelligent and sterile women fertile and happy. However, it is probably better not to rely too much on its magical powers, since it was also claimed that you could immerse your hand in boiling water after a topaz had been thrown into it and retract it again unharmed! It is the stone of November. 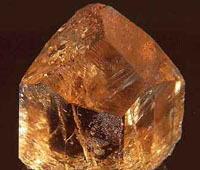 In the Empire style, the topaz was still widespread, but then the more reasonably priced citrine took over from it and even usurped its name - gold topaz. Since then, the topaz has been a rather exotic figure in the jewellery trade, and has been given the additional predicate 'pure' to make it clear that the topaz, not the quartz topaz, is meant. And it is still waiting for its well deserved comeback to this day. One can trace it in Pakistan’s Mardan, Tatling and Northern Areas. Copyright © 2014 - 2015 Gold & Gems Art Promotion Council, All Rights Reserved.